The first year of output from Rabbit Rabbit's monthly subscription service is a solid record, but will listeners in a digital world embrace a pay-before-you-listen model? Imagine a world without record labels, a world that has seen a return to direct patronage as a viable business model, where fans of an artist give the artist money so that the artist can make pretty things. This was the standard for centuries. Renaissance painters didn't have to hire managers and publicists. Michelangelo didn't submit sculptures to an A&R department and get rejected because his stuff didn't look enough like Vasari's. Under the moniker of Rabbit Rabbit, Carla Kihlstedt and Matthias Bossi are trying a full-on return to the direct patronage model via a subscription service called Rabbit Rabbit Radio. On the first day of every month, they release a song on their website along with videos, liner notes, photographs, and more. For $2 to $5 per month, a subscriber can download the song, enjoy the other content, and support the band directly. It's an iffy proposition in a world already saturated with cheap-to-free content, but we'll get to that later. First, the music. 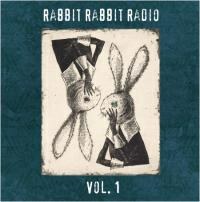 Rabbit Rabbit Radio, Vol. 1 is a compilation of the service's first year of output. It's a tremendous listen, a gripping journey through a rich sonic landscape. Listening to anything on the actual radio and then listening to Vol. 1 is like Bugs Bunny falling asleep in a space shuttle on Earth and waking up on a different planet full of vivid colors and strange creatures. It's tough to name a standout track on Vol. 1 because each is a fully developed, self-contained universe. The throwback acoustic chug of "Hero and a Saint" doesn't fit with the emotive screaming of "Newsreel," which doesn't fit with the lounge vibe of "Home Again." Amazingly, though, like the disparate elements that comprise our own universe, Vol. 1 still hangs together as a cohesive whole. "Curious One" might be my personal favorite. It builds a tense atmosphere with tribal drums, plucking strings, and poetic lyrics. Carla's voice floats through the verses while the hypnotic chant of the chorus pulls you deeper and deeper into the song. Vol. 1's tracks are by and large mesmerizing, unique compositions. There's a crackling energy throughout the album that only dips slightly toward the end, a feat made even more impressive when one considers that the album likely wasn't written and recorded all at once. It's hard to compare Rabbit Rabbit to other bands, either from an artistic or business standpoint. They live in uncharted territory. A subscription-based pay-before-you-listen service is an unproven model for music distribution. With streaming sites popping up like a plague of poorly curated locusts, and sites like Noisetrade providing access to gobs of material of varying quality for free, it's a hard sell to ask someone to pay $24 to $60 for 12 songs. Rabbit Rabbit evokes the nostalgia of "bringing home a new record, a gatefold LP, or even a beautifully designed CD", but that's more money than Tower Records or Circuit City was charging at the height of the big box retail CD markup boom. Granted, money paid to Rabbit Rabbit Radio comes with heaps of bonus material, a more personal relationship with the band, and a more ethical approach to consuming art. But, to put it into perspective, for absolutely nothing a listener can stream 20 million songs on Spotify. It's true that indie artists are better off busking on the street than relying on streaming site residuals, but this does not change the fundamental economic decision that faces a listener. Then, there is the cost of operating such a site. Per a New York Times article, with more than 900 subscribers, already the band is barely making a profit. That's the double-edged sword of such a model. At $24 to $60 per year per artist, not including concert tickets or merchandise, how many artists could one listener afford to support? And how many bands could survive on this model? Rabbit Rabbit comes better equipped than most with an established fan base from the band members' involvement in groups like Sleepytime Gorilla Museum, but only time will tell. All of that being said, Vol. 1 is a solid argument in favor of this model being viable. After all, high-quality products fetch higher prices in the marketplace, and it would be foolish to argue that Carla and Matthias lack the talent and creativity to make a real run at this. They are trendsetters, not followers, and Vol. 1 is proof of that.